As smart meter installation continues, consumers have questions about the safety of this device, more specifically people want to know if there are smart meter dangers that can cause health related problems. In fact, our office has received a large number of calls from individuals which state that they have experienced significant health problems after the installation of Smart Meters. The installation of Smart Meters at residential buildings has created a public outcry about potential or perceived health effects. We have received numerous calls from the public for the evaluation at their building. To address these questions appropriately we have researched the scientific literature on the technical specifications and measurement methodologies. 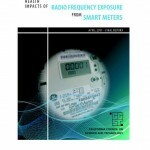 The issues involved with the evaluation of Smart Meter dangers are very complex. We have summarized our findings in this paper to provide a better understanding of the subject matter and issues involved. We have used the following publications as our reference sources. Based on the technology described in these papers, we have conducted some research on our own. The documents are available on the Internet free of charge. Our findings and measurement challenges are summarized in this report. Smart Metes are digital meters which record electrical, gas, and water usage. The data is then transmitted wirelessly to the utility companies. Smart meters are currently installed throughout California, many other states and eventually in all 50 states as well as in Canada. These Smart Meters are referred to as access points. How the process works is, the information from individual meters or access points is sent to utility access points, which act as data collection points before forwarding the data to the utility company. The utility access points are commonly located on power poles and street lights. The entire system is referred to as a mesh network allowing for continuous connections around broken or blocked meters or data pathways. Smart Meters provide real-time data to the utility provider and in the future to the consumer in the proposed real-time smart grid. There are various technologies in use to transmit the data: (A) Wired via cables such as fiber-optic, copper phone lines, or cable; (B) Wired via power lines such as power line communication or broadband over power lines; and (C) Wireless via antennas (e.g. GPRS, GSM, ZigBee, WiMax). In California and many other states a wireless network was chosen. The installation of Smart Meters is only the first phase. In the second phase, individual appliances will communicate with the Smart Meter. This provides information on when and how much electricity a particular appliance utilizes. The information will then be available to the consumer to make “smart” choices regarding their electrical usage. 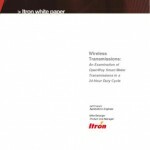 The communication between appliances and Smart Meters will occur wirelessly. This communication system is referred to as the home area network or HAN. Health, environmental, privacy, and billing concerns have all been voiced over the installation of these meters which has created quite a bit of smart meter controversy. Citizen action groups and websites have been formed. Numerous city councils have put a moratorium on the installation of meters until more information is available. 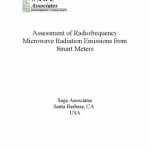 This document will summarize these concerns and is focused on the emission from meters and exposure prevention. A large number of individuals have reported significant changes in their health and well-being related to the installation of wireless Smart Meters on their property. This has led to community activism against the installation of wireless meters, with websites and appeals to decision makers and politicians. The main symptoms reported by individuals are: sleeping disorders, insomnia, tinnitus (ringing in the ears), fatigue, nausea, dizziness, irritability, listlessness, heart palpations, and changes in cognitive behavior. With the installation of millions of Smart Meters, their repeaters, and data transfer, the number of cellular transmitters is dramatically increasing and changing our RF exposure and environments. These fields do not occur in nature. In the second phase, when our electrical appliances are talking wirelessly to the Smart Meter, the RF levels and exposure to RF frequencies inside our buildings can be raised. Most Smart Meters are designed to also work in wired mode. Some utilities allow the installation of wired systems. With the remote access to electrical, gas, and water usage in a building, the private lifestyle becomes apparent to the viewer of the data. Hacking into the data transmission is another concern. Are you taking a shower right now or not? Customers have also reported significant increases in billing for utility services. Smart Meters certainly allow monitoring and billing with a tiered-rate system which may significantly increase consumer costs. 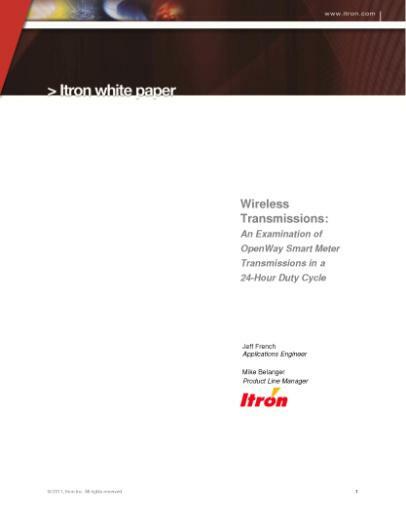 Wireless Smart Meters are able to receive and transmit data using a wireless network. The transmission occurs with a dipole antenna to reach utility access points or repeater units. Two or three different frequency bands are being utilized. 902-928 MHz (megahertz) band for transmission to repeater units. These frequencies are similar to frequencies used in cellular phones, wireless computer networks, DECT cordless phones, baby monitors, Wi-Fi systems, and other wireless networks and devices. 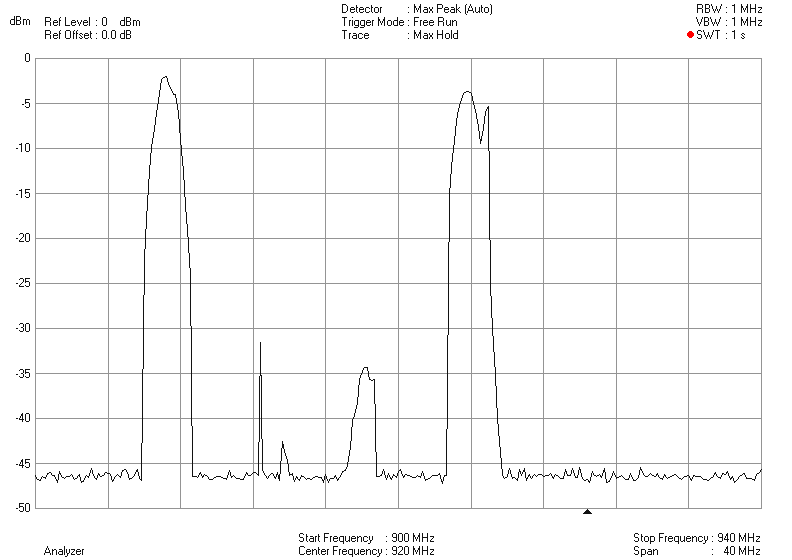 The meter uses a technology which is referred to as frequency hopping spread spectrum (FHSS). That means the transmission frequency will change constantly during a given time period. The following measurements were performed with a computer software-based system provided by Metageek. 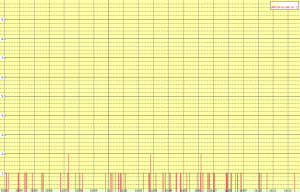 It shows the frequency range between 902 and 928 MHz on the x-axis (horizontal). The amplitude or field strength of the signal is expressed on the y-axis (vertical). 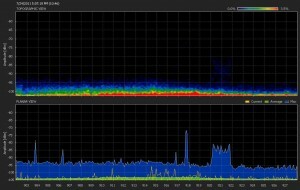 The graph above depicts the frequencies present in a residential home without a wireless Smart Meter. The peaks show the amplitude (strength) of the signal. 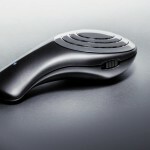 The largest peak in the 918 MHz range is emitted from a cordless phone. 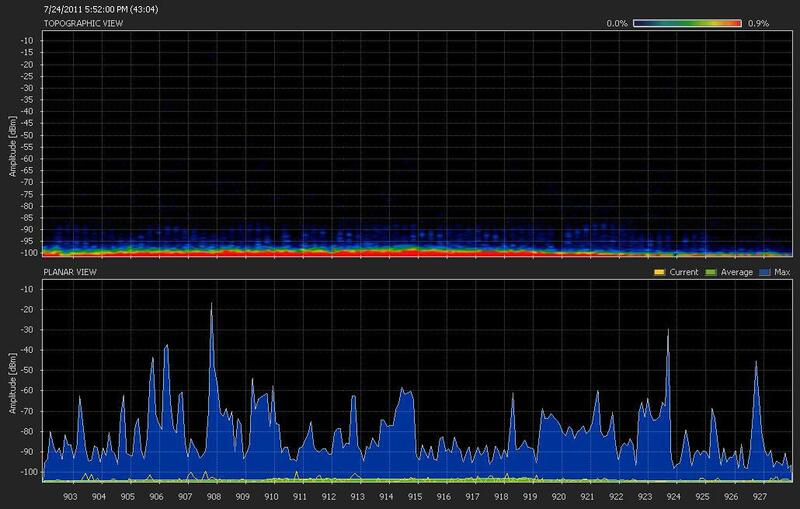 The amplitude shows maximum signal strength of approximately -70dB. The graph above depicts measurements conducted outside at a one-foot distance from a Smart Meter. The largest peaks are now in the -20dB range. 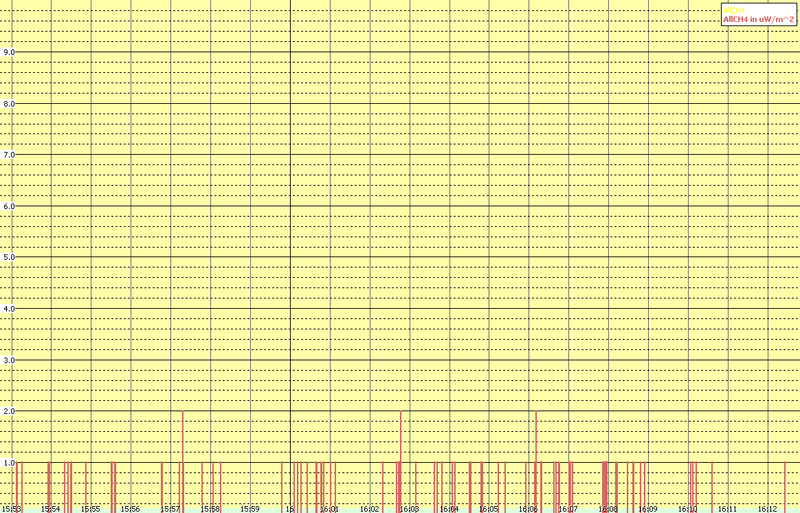 This constitutes a 100,000 fold increase in the power density (signal strength). The data from the wireless Smart Meter is sent out in short transmission bursts, which usually last only from 12 to 120 milliseconds (ms) at a time. These transmission times are referred to as duty cycles. A 100% duty cycle corresponds to continuous operation, e.g. 24 hours/day. A 1% duty cycle corresponds to a transmitter operation of 1% per 24 hours, which means 14.4 minutes/day. When we tested measurements at one residential meter, we manually counted the number of bursts for a ten-minute time period. The number of bursts varied significantly over the time period. We used a simple consumer instrument which only provides an audible signal when the field strength increases. 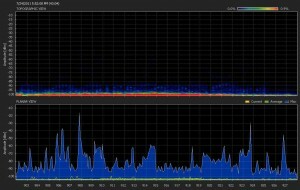 We used this tool to audibly and manually count the frequency bursts. The table below shows the result for this meter located in a residential development in San Diego County with the assumption of 50 ms bursts. Next, we used a professional broadband meter with an isotropic probe to measure the data burst and amplitude over time. A Wavecontrol SMP with a WPT 8 probe was used at the Smart Meter. 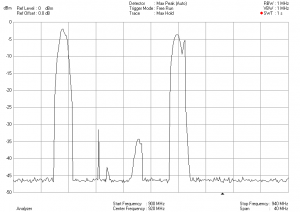 The frequency range of the instrumentation with the probe is 100 kHz to 8 GHz. The graph below shows the results of the data logging. The difficulty most professional instruments have is that they collect the data twice per minute. However, when the short (50-millisecond) burst occurs during the time when the instrument is not recording, it will not be visible. Only if the measurement period and transmission burst coincide in time will the signal be recorded. This is likely to account for the different amplitudes detected. The instrument may measure when the signal is building up or phasing out. This appears to be the reason for the significantly varying amplitude. The graph also shows the disadvantage of looking at and reporting the average power levels only because the signal strength disappears as background noise. Thirdly, we used a Gigahertz RF meter with a data logger attached to the instrument to count the transmission bursts over time. The following instrumentation was used: Gigahertz HF59B instrument with probe HF800V2500 and the NFA 1000 data logger. This set of instrumentation appears to have a higher capture range of the transmission pulses. The graphic below shows a 17-minute time period at one-foot distance from an Itron Smart Meter. These measurements show a much higher duty cycle than anticipated by most entities. However, the instrument clipped the amplitude levels of at a certain high. Therefore, we could not measure the strength of the signal. It is possible we need to make some adjustments to the recoding modes. We conducted initial power density measurements and found that it can be difficult to measure these short transmission bursts. 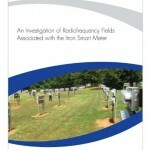 A variety of previously mentioned RF Instruments were used at a distance of one (1) foot from the meter. The results varied significantly between the different instruments; therefore, we are only reporting our spectrum analysis results here. A Rhode &Schwarz FSH3 spectrum analyzer was used in conjunction with a directional periodic-logarithmic antenna. 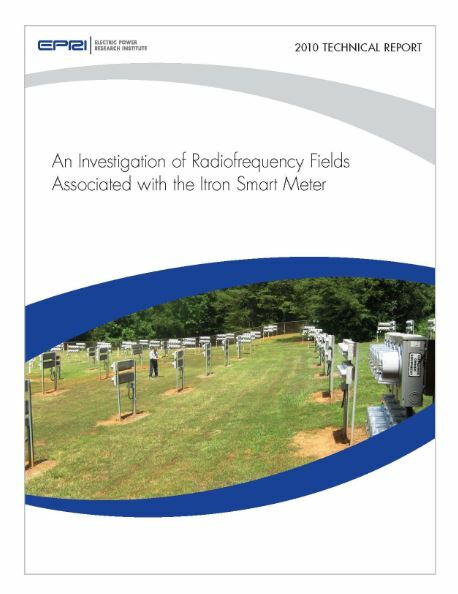 Measurements were performed at a distance of one (1) foot from the Itron Smart Meter. A max peak detector with max hold function was selected. The peak hold value was recorded. The California Council on Science and Technology (CCST) used 50% duty cycles in their charts and graphs to extrapolate compliance with the FCC standard. According to CCST the following exposure levels are emitted. The Federal Communications Commission (FCC) in conjunction with the American National Standards Institute (ANSI) and the National Council on Radiation Protection and Measurements (NCRP) have established rules to protect workers and the general public from known RF hazards. The FCC rules establish limits for emissions from devices and exposures to the population. These regulations are based on thermal effects to human tissue (heating). The thermal heating effect of radio frequency (RF) radiation on humans has been studied and is well understood. Non-thermal effects were not taken into consideration for the basis of these regulations. Some scientific studies have shown that non-thermal effects due to cumulative or prolonged exposure to lower levels of RF emissions can cause adverse health effects. The lack of a definitive cause with scientific acceptance is being cited as the reason for the exclusion of the non-thermal effects in regulations. The BioInitiative Report provides a good summary on the studies of non-thermal adverse health effects detected1. The specific absorption rate (SAR) is related to the power emitted from wireless devices such as cellular phones. The SAR limit is 1.6 Watt of power per kilogram of body weight (W/kg). The amount of radiation an individual can be exposed to is limited by the maximum permissible exposure (MPE). MPE is expressed as a percentage of the allowable exposure. The allowable limit varies with the frequency, occupational and general public exposure. The following table shows regulatory RF levels, suggestions and recommendations by different entities. Accurate and precise measurements for the power density and duty cycles are not easily performed even with costly professional equipment. Few instruments are able to detect the short transmission bursts properly. Average power density readings are misleading because they severely underrate the peak power levels. Distance from the meter as well as the number and density of the wall assemblies between the meter and the living and sleeping areas have a significant impact on the RF exposure. The larger the distance is and the greater the wall density is, the lower the RF exposure will be. Smart Meters can be installed in a wired mode via phone lines, cable, fiber-optic, or copper wiring. Some utilities allow the installation of wired systems. This would provide the lowest RF exposure levels for occupants. If measurements for wireless Smart Meter are conducted, peak amplitude levels and the burst cycle (duty cycle) should be recorded and extrapolated. 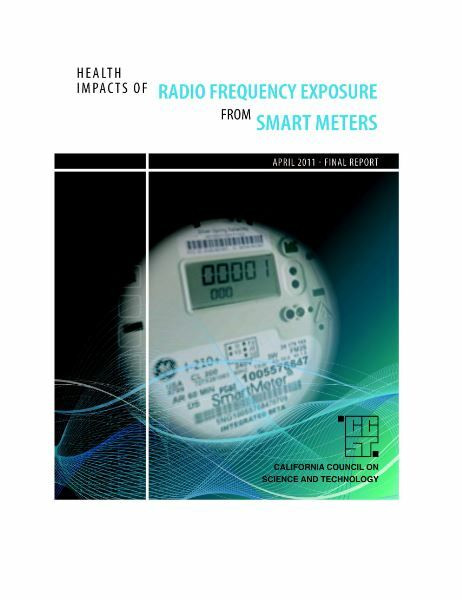 If health problems are experienced with the installation of Smart Meters, a comprehensive EMF and RF survey should be conducted to rule out other sources of elevated electromagnetic fields. We recommend an EMF survey according to the Building Biology Standard SBM 2008. This will provide information on the most appropriate reduction or shielding methodology. Research is currently ongoing to evaluate if the Smart Meter’s switching mode power supply is creating dirty electricity (signal distortions), which may be carried throughout the building through the electrical circuits. The installation of interior wall shielding appears to be the most effective alternative. Many RF attenuating (reducing) materials are available such as RF-specific copper wire meshes, shielding drywall, paints, glass films, and fabrics. These are specialty products and are more expensive than regular construction materials. The exterior shielding of meters may not be very useful but may impede the operation of the meter and may be counterproductive. Shielding kits are already being sold on the Internet. How effective they are should be evaluated by taking before and after installation measurements. 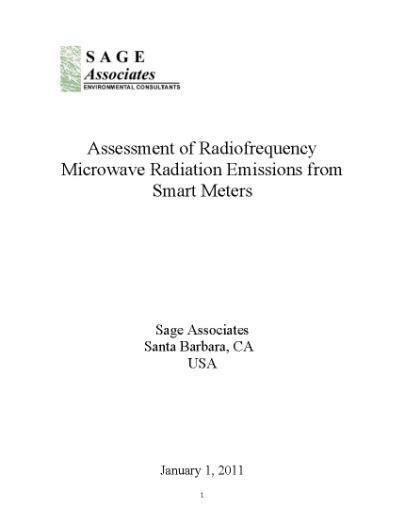 Consumers should be provided with clearly understandable information about the radiofrequency emissions of all devices that emit RF radiation including smart meters. Such information should include intensity, duration, and frequency of the power output and, in the case of smart meters, the pattern of sending and receiving transmissions to and from all sources2. Be also aware that any electric meter—be it analog, digital, or smart—is a “hot spot” for elevated magnetic fields, which is why frequent-use rooms such as bedrooms and dining areas should be located away from electrical meters. The Appendix tables on the follow pages are provided by Katharina Gustavs with Rainbow Consulting in Canada. She has reviewed the listed reference papers, extracted the measurement information, and compared the data with other entities, standards, guidelines and recommendations on exposure values. In appendix C, she lists a number of resources and references and their websites. Thank you Katharina. Values in square brackets are not listed in the quoted report, but inferred based on the formulas provided. * Near-field exposure from handsets. All listed exposure guidelines apply to far-field exposure situations. Wolfgang Kessel: Radar – Eine unterschätzte Gefahr. In Elektromagnetische Verträglichkeit Energieversorgung & Mobilfunk. 3rd EMC Conference of the VDB 2004, p. 195.